Kentucky Lake, which borders Kentucky and Tennessee, is mainly known for its crappie fishing but does have some real good bass fishing, too. Kentucky Lake is one of the largest man made lakes in the United States. It has 2,380 miles of shoreline and covers 160,000 acres. There are many resorts surrounding Kentucky Lake, both in Kentucky and Tennessee, that cater to anglers. 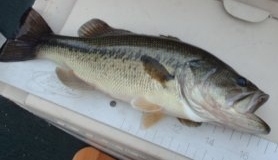 The one time I went there I went the last week of May, specifically for bass. With the lake being so massive it took me a little while to get my bearings and I had to ride in the boat for a while checking the depth finder and throwing a couple casts to see what was out there and what they may be looking for as far a lure selection and color. Around 11:30am, I started to get them hitting on a gold color soft jerk bait, it almost looked like a gold fish. I have to tell you though, that once the bass started hitting they didn't stop. For about two straight hours it felt like every cast I was catching a fish. I found them hiding off of a steep point in 10 to 15 foot of water. I was just fanning my cast from one side of the point to the other. The next day when I went back it was extremely windy so I couldn't head out to the main part of the lake. However, in the cove I fished I came across another school of bass which kept me busy for a few hours. This time they weren't holding to a point but they were holding on a steep drop off just like they had to the point the day before. I haven't made it back yet but I definitely plan on it. I had a great time and caught quite a few fish like the one you see pictured here. They aren't huge, I never have luck like that. But they were a whole lot of fun to catch. When I go back I want to try the crappie fishing. I will let you know how that turns out.